450+ lots. 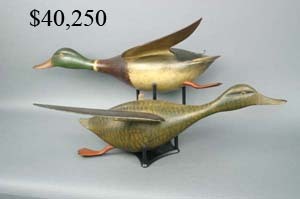 Featuring decoys from the collections of Peter & Janet Van Trigt and Tom Fuller. The action gross was $2,650,000. 66 lots sold for over $10,000 each, 33 lots sold for over $20,000 and 1 lot sold for over $200,000 for an average of over $5000 per selling lot. 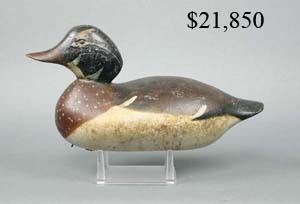 This auction featured decoys from the collection of Pete & Janet Van Trigt. 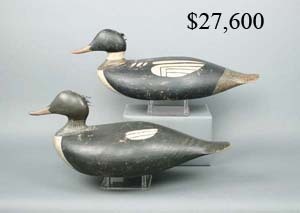 Top lot in the sale was a pair of mallards by Bert Graves of Peoria, Illinois, which sold over estimate for $214,000. Pair of mallards by Charles Schoenheider, Sr.